(Nanowerk News) Physicists use theoretical and experimental techniques to develop explanations of the goings-on in nature. Somewhat surprisingly, many phenomena such as electrical conduction can be explained through relatively simplified mathematical pictures — models that were constructed well before the advent of modern computation. And then there are things in nature that push even the limits of high performance computing and sophisticated experimental tools. Computers particularly struggle at simulating systems made of numerous particles interacting with each other through multiple competing pathways (e.g. charge and motion). Yet, some of the most intriguing physics happens when the individual particle behaviors give way to emergent collective properties. One such example is high-temperature superconductivity, where the underlying mechanism remains poorly understood. In the quest to better explain and even harness the strange and amazing behaviors of interacting quantum systems, well-characterized and controllable atomic gases have emerged as a tool for emulating the behavior of solids. This is because physicists can use lasers to force atoms in dilute quantum gases to act, in many ways, like electrons in solids. The hope is studying the same physics in the atom-laser system will help scientists understand the inner workings of different exotic materials. JQI physicists, led by Trey Porto, are interested in quantum magnetic ordering, which is believed to be intimately related to high-temperature superconductivity and also has significance in other massively connected quantum systems. 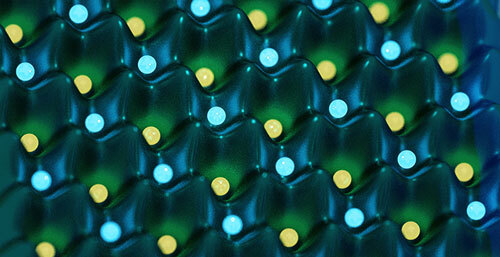 Recently, the group studied the magnetic and motional dynamics of atoms in a specially designed laser-based lattice that looks like a checkerboard. Their work was published in the journal Science ("Two-dimensional superexchange-mediated magnetization dynamics in an optical lattice"). To engineer a system that might behave like a real chunk of material, the team loads an ultracold gas of around 1000 rubidium atoms into a two-dimensional optical lattice, which is a periodic array of valleys and hills created by intersecting beams of laser light. The atoms are analogous to the electrons in a solid; the lattice geometry is defined by the pattern of laser light. The depth of the lattice can be precisely adjusted to allow for certain types of atom behaviors. For this research, atoms can move between the lattice sites via quantum tunneling — this is the motional component. Secondly, each atom can be thought of as having an orientation similar to that of a magnet*, ‘up’ and ‘down.’ Like magnets, the atoms, under certain conditions, can interact to form ordered arrangements in the lattice (e.g. up-down-up-down…). However, observing the emergence of such magnetic states has been challenging because these particular phases of matter are only revealed when the atoms have extraordinarily low energy, here considered as an effective temperature. A typical ultracold atomic gas is around 10-100 nanokelvin. To glimpse magnetic order in an optical lattice, the atoms need to be at picokelvin temperatures, 10 to 1000 times colder. Porto’s experiment takes a different approach — the researchers work in a regime out-of-equilibrium where magnetic dynamics can be induced at higher, more amenable temperatures. While the daunting picokelvin criteria remains, the authors believe that this methodology will open up new pathways for achieving and studying quantum magnetic matter in lower temperature, equilibrated systems. The team uses a novel ‘checkerboard’ lattice, in which they have exquisite control over the different sites; this gives them the ability to study both the motional and magnetic behavior of the atoms. The lattice is constructed from two controllable sublattices, denoted A and B, which together form an array of ‘double-wells’ (see above graphic). The researchers can create desired magnetic order by altering the relative depth of sublattice B with respect to sublattice A. This same mechanism is also employed to drive dynamics between lattice wells. In the beginning of the experiment, all atom magnets are initialized in the ‘up’ orientation and are trapped in a two-dimensional uniformly deep optical lattice. The second step is to flip the atoms in the B lattice to ‘down’; this makes the system antiferromagnetically ordered and out-of-equilibrium. Next, the depth of sublattice B is suddenly changed in a maneuver called a ‘quench.’ Essentially, the quench kicks the system, initiating dynamics across the lattice. The atom magnets flip up and down and tunnel between sites as they relax to a configuration that is, in this case, no longer magnetized. *Physicists use mathematical models, such as the bosonic t-J model studied here, to understand quantum magnets. Thus for clarity in this news item the atoms are called “magnets.” In the language of the Science article, they are called “spins”.